The first thing you have to do when planning a Camac harp event in Cardiff is to make sure there isn’t a rugby match on. The second thing you have to do is to make sure wherever it is that Wales have got their away match, it’s not against the French. 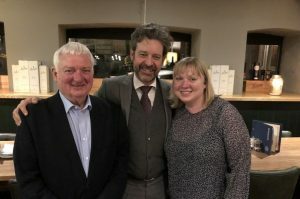 The Six Nations on March 9th in Edinburgh was Wales v Scotland, so the coast was clear for our Franco-Welsh entente cordiale. For the Cardiff Camac Harp Weekend 2019, Telynau Vining · Camac Harps Wales had invited some of the most well-known artists from both sides of the Channel. 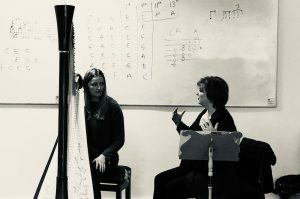 Students could benefit from a classical masterclass with Caryl Thomas, Head of Harp at the Royal Welsh College of Music & Drama, and co-leader of the host artistic committee at the 2020 World Harp Congress (wisely scheduled for July, out of rugby season). 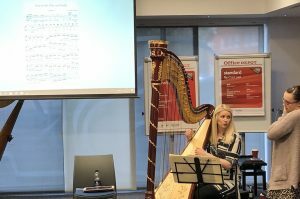 Heather Downie, tutor in world music at the Royal Conservatoire of Scotland, introduced us to Scottish pipe tunes in the context of their relationship with the harp, and also gave her increasingly famous “For the Love of Levers” class. 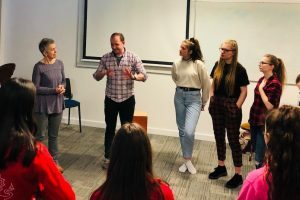 Natasha Gale, co-organiser of the Wild Strings jazz and pop harp festival in 2018, gave a pop workshop, vamping and improvising around Ed Sheeran, Jess Glynne, Ariane Grande, etc. Heather and Natasha also both held “Hands on Harp” sessions for complete beginners, of any age, and in another class, Natasha connected the harp with meditation, relaxation and yoga. 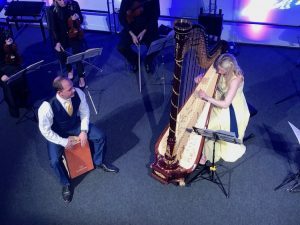 Claire Jones, former Harpist to the Prince of Wales (2007-2011), did much to raise the profile of the harp during her time in royal office. She continues this today, frequently together with her husband, the percussionist and composer Chris Marshall. 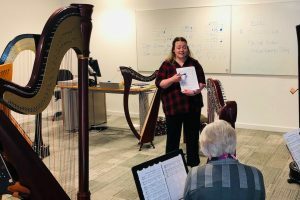 Chris has now made nigh-on fifty arrangements for harp, harp and strings, and Claire’s harp school; he combines these with original compositions, frequently with world music influences. The result is a dynamic, varied show, linking two more unusual instrumental fields with the musical mainstream. Claire and Chris are also active teachers, and here too they are a great double-act. Harpists are not renowned for their rhythmic accuracy, and we all got a huge amount out of Chris’s “I got rhythm” workshop (never again will I attempt 11/8, without muttering “I am knitting a jumper”). He also lectured on writing and arranging for the harp, improvisation skills, and ensemble playing. A propos: a very big thank-you to the students of the Claire Jones Harp Ensemble, who gave us an excellent taster of their programmes as part of Claire and Chris’s Sunday night concert. In the music press, Claire has also talked openly about her struggle with Chronic Fatigue Syndrome. 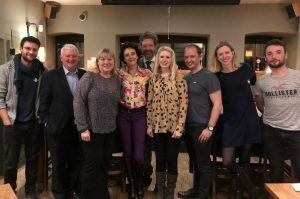 This sort of honesty is rare in a profession that doesn’t do sick leave, but there is increasing awareness that the pressures need to be better acknowledged, and musicians better supported. In Cardiff, Claire therefore also gave very useful classes on performance skills, warming-up well, and “Under Pressure”. Traditionally, musicians have been left to work much of this out for themselves. But the fact something’s always been done a particular way doesn’t have to mean it’s a good idea (like the working hours of junior doctors, for example). 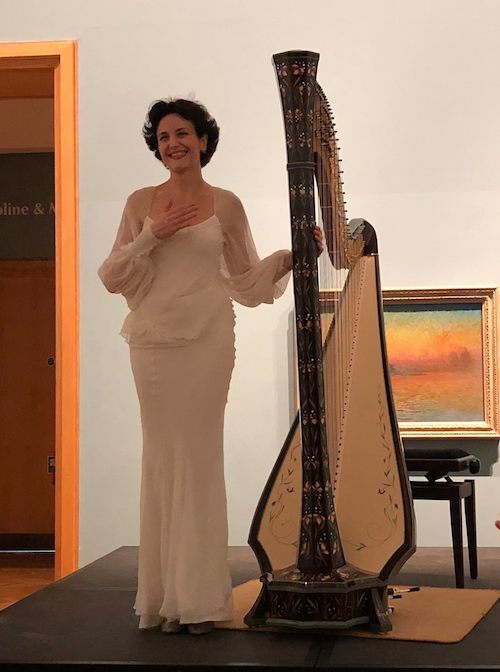 On Saturday, March 9th, we moved to the Impressionists Gallery at the National Museum, for an exceptional recital by Isabelle Moretti. We spend all day, every day with the harp, in all its forms. To witness such complete mastery of our instrument is something that never grows stale, and we never forget it. It was quite something to have one of these experiences, immersed in French and (its close neighbour) Spanish repertoire, surrounded by some of the greatest and most famous works of French art. 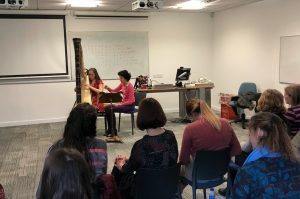 The following day, Isabelle gave two masterclasses: one general, and one intensive session entirely on a key French work: the Pierné Impromptu-Caprice. 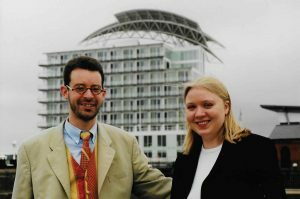 Congratulations to Elen and Paul Vining for a beautifully-conceived and executed weekend, and indeed for twenty years of collaboration, and friendship. The first picture below is taken shortly after our partnership began, and the second on March 10th, 2019. 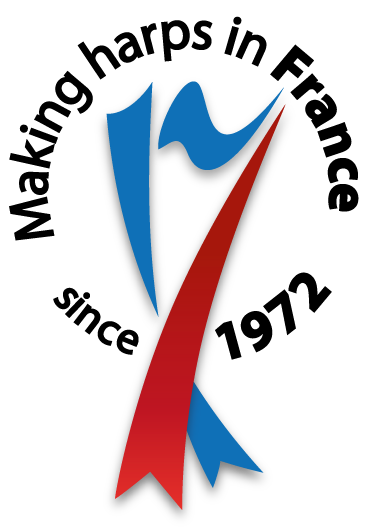 Here’s to the next twenty years! 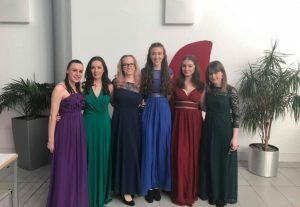 Bravo to the wonderful members of the Claire Jones Harp Ensemble!